Facebook is not just a social forum to share pictures with friends anymore. Businesses are pushing traffic to their ecommerce sites, increasing brand awareness and now making sales on Facebook stores. I looked at the top ten brands on Facebook with the most Fans as analyzed by All Facebook’s Page Statistics, an unofficial Facebook page tracker updated daily. The ranking data is current to Tuesday, March 22, 2011. Just browse the top brands on Facebook and study what they do — and don’t do — to help generate innovative ideas for your own company’s Facebook page. I then observed the top celebrity and branded Facebook pages running Facebook stores to see how they run their individual stores. In total, I looked at over twelve-hundred Facebook pages and pulled the most interesting and innovative pages either by ranking of total Fans or just for their news and practical advice. These pages are the top ten branded Facebook pages, but their true overall ranking ranges within the top fifty pages on Facebook. I removed celebrity, game and interest pages to distill this list down to only business brands. These top ten prove that you don’t necessarily have to sell anything on Facebook to make good use of the platform. Facebook. 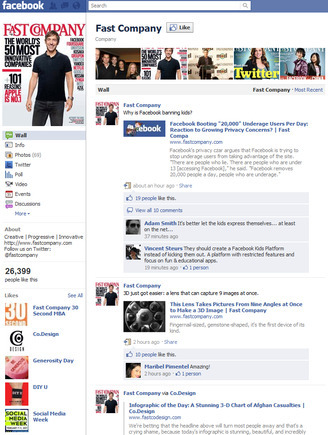 Facebook’s very own page is second only to a Zynga game app page on Facebook itself and although expected that Facebook would be highly ranked on its own platform, it does some interesting things on its page from live streaming of current events, live chat, a resources page with links to tips for businesses and developers and much more. Ranked 2 overall with 36.4 million Fans. YouTube. YouTube posts contests and Fan participation events like its recent “Life In A Day” personal video upload event as well as ranking of the top videos on its site from news to music to the bizarre – all of which can be easily shared and viewed right in Facebook. Ranked 6 overall with 29.5 million Fans. Coca-Cola. Coca-Cola’s Facebook page focuses more on the lifestyle of the brand’s users rather than selling anything at all on Facebook – it has dozens of pages for Facebook oriented events, Fan participation, virtual gift giving of digital Coca-Cola buttons of products to other Facebook users, music and even downloads – all for free. Ranked 13 overall with 23.7 million Fans. Starbucks. Features live streaming of Starbucks events, Starbucks job search, links to over thirty international Starbucks Facebook pages and more. Ranked 22 overall with 20.3 million Fans. Disney. 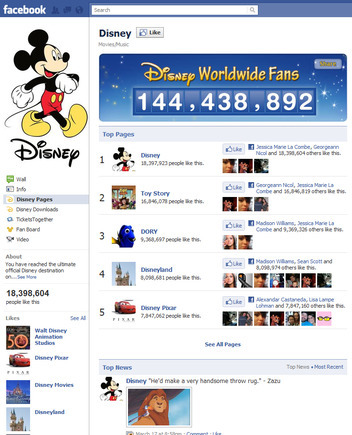 Disney provides easy access to and easy-Liking of its dozens of branded Facebook pages, boasting a total of 144.4 million Fans across all of its pages. They offer free desktop wallpaper downloads, movie ticket buying for the latest Disney film in theaters, trailers and Fan discussion boards. Ranked 31 overall with 18.3 million Fans. MTV. One of the ultimate youth brands is also popular on Facebook with news from the entertainment sector, contests and game apps even a social network-oriented weight loss program for its Fans. Ranked 34 overall with 17.9 million Fans. Oreo. Several pages dedicated to Oreo cookie recipes, fun interactive Fan games where users can upload pictures of themselves as well as a call to all Oreo Fans to share pictures of themselves with the product. Ranked 35 overall with 17.4 million Fans. Skittles. Featuring regular photo upload contests for Fans to win prizes, humorous posts on its wall news feed and more. Ranked 45 overall with 15.6 million Fans. Converse All Star. A simple page that mostly relies on pictures of the product and videos of artists, musicians and athletes that love the brand or are sponsored by it. Ranked 49 overall with 14.7 million Fans. These are five of the top celebrity pages with the largest amount of Fans on Facebook also operating Facebook commerce stores — all within the top fifteen overall Facebook pages with the most Fans. Michael Jackson. 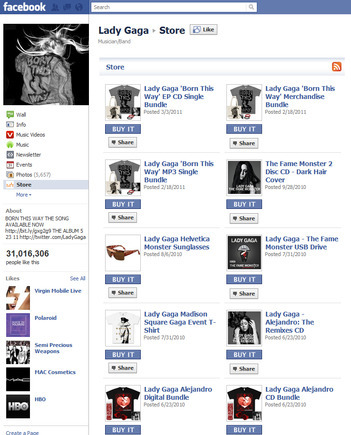 Features a store similar to Lady Gaga’s selling figurines, books, clothing and other Fan-oriented merchandise that is easily shared with friends on Facebook. Again, purchasing redirects potential customers to the main Michael Jackson website store. Ranked 5 overall with 30.4 million Fans. Rihanna. Offering a way for Fans to buy limited and specialty goods right on Facebook as well as from the main Rihanna store outside of Facebook. Fans can also sign up for a newsletter. Ranked 7 overall with 29 million Fans. Linkin Park. Similar in design to the Rihanna store, Linkin Park Fans can purchase music, clothing and limited edition merchandise from the store. Customers can also sign up for a subscription service that gives them discounts on goods, alerts to tickets before the public announcement and chances for meet and greets. Ranked 9 overall with 24.9 million Fans. Justin Bieber. Bieber’s store offers clothing and toys for Fans as well as the ability to share any product in the store on your own Facebook page. Fans can also purchase movie tickets, sign up for a newsletter, watch videos and download free images. Ranked 12 overall with 23.8 million Fans. Here is a sampling of ten highly ranked business brands with Facebook commerce stores. They range from within the top fifty to top twelve-hundred in total Fans and are some of the largest retail brands on Facebook. Mafia Wars. Download dozens of popular Facebook games, review products and more — all for free. Ranked 42 overall with 16.3 million Fans. Victoria’s Secret. Although Victoria’s Secret does not sell its products on Facebook, it does offer an innovative way to send gift cards through Facebook that can be redeemed online and in stores, as well as free wallpaper downloads and product spotlights. Ranked 60 overall with 12 million Fans. iTunes. iTunes doesn’t sell anything on its Facebook page, but it does allow users to watch the most popular music videos and download ten free songs and participate in interactive polls. Ranked 61 overall with 11.9 million Fans. PlayStation. Featuring interactive ads for the latest video games on the console that allow users to get free bonus items that they can use during game play when they purchase the product at participating retailers. Ranked 67 overall with 11.1 million Fans. 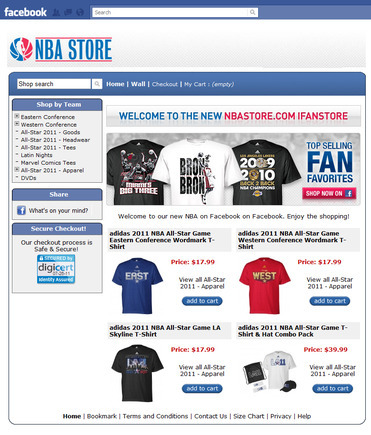 NBA Store. The NBA has a full-featured store all inside Facebook with hundreds of items for sale and Facebook credits with purchase through the store for use with Facebook games. Ranked 120 overall with 7.9 million Fans. WWE Shop. WWE (wrestling) features a limited product store for browsing on Facebook and then redirect to the WWE Shop website for purchase as well as interactive Fan sweepstakes opportunities and ticket sales to WWE events. Ranked 257 overall with 4.8 million Fans. Best Buy. Featuring thousands of products to browse and share with friends by posting the product on your Facebook wall. 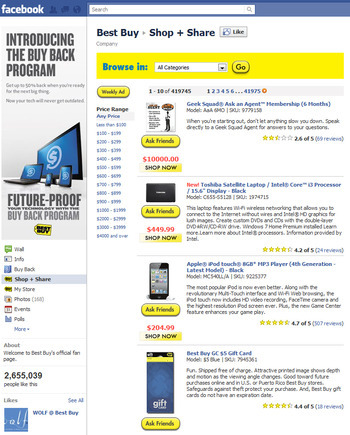 When customers are ready to purchase, they are automatically redirected to the main Best Buy website. Ranked 587 overall with 2.7 million Fans. Vans. Vans has a full shop that can handle everything from browsing to placing items in a shopping cart but then redirects customers to the main Vans’ website for checkout. It also features videos of athletes, Vans’ event coverage and live streaming video of concerts. Ranked 793 overall with 2.1 million Fans. Old Navy. Old Navy has a large interactive catalog on Facebook that allows customers to like items and post items to their pages to share with friends. For purchase, customers are redirected to the Old Navy website outside of Facebook. Ranked 1042 overall with 1.7 million Fans. JC Penney. Similar to the NBA Store in design, JC Penney has a full interactive catalog where users can select specific items and place them in their cart and purchase them — as well as share items with friends — in Facebook. Ranked 1193 overall with 1.6 million Fans. Below are fifteen business news pages on Facebook. Stay up to date with the latest business and market data from around the world in your Facebook News Feed. The New York Times. The official Facebook page of The New York Times – it posts top stories and breaking news. The Economist. One of the most venerable financial magazines has a Facebook page with links to business articles and stories from the magazine and around the web. Financial Times. Stay current with all the latest financial news from around the world. The Wall Street Journal. Links and commentary to top Wall Street Journal breaking financial and business news. The Huffington Post. This popular news aggregator’s Facebook page has links to all the specific news sections including HuffPost Tech, local city news and HuffPost Business. Forbes. Business advice, news and analysis from Forbes magazine. Entrepreneur Magazine. Links to Entrepreneur’s coverage, interviews and advice — from its magazine. 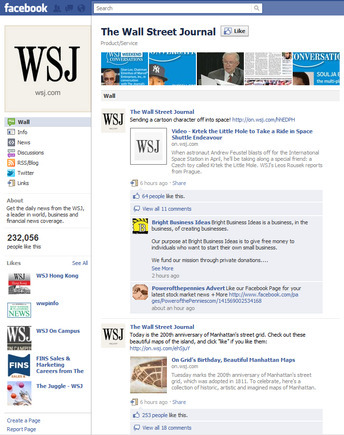 Wall Street Journal on Facebook. Inc. Magazine. Links to business-related articles and contests from Inc. Magazine. CNN. Cable news outlet’s social page with posts to its videos and stories online. Fox News Channel. Get the latest breaking news from this news source as well as links to all the Fox News personalities Facebook pages from Shepard Smith to Glenn Beck. NPR. World news, business analysis and coverage of arts and entertainment from NPR. Small Business Saturday. American Express sponsors this small business page as a forum for small businesses to share their stories, and celebrate their successes. Practical eCommerce. Links to all the latest in ecommerce from our very own Practical eCommerce. Internet Retailer. Web-based retail information source with links to articles from the magazine and trade show. Here are nine informative tech news organization’s Facebook pages. Mashable. Links to all of Mashable’s coverage of social media, tech and digital news. Fast Company. A helpful source of information on all things innovative in tech and business from around the world. Engadget. Detailed coverage of the latest in technology, especially mobile devices. TechCrunch. The Facebook page for the ever-popular blog focused on startup businesses, web products and the latest breaking tech news. Smashing Magazine. Links to Smashing Magazine’s developer-oriented news, tips and more. Wired. Links to the popular technology and culture magazine’s articles and insights. Slashdot.org. For the latest news and opinion on all things tech on the web, mobile, hardware and software. Apple App Store. The latest announcements from Apple’s app store, featuring regular free apps and tips and tricks for usage of various featured apps for download. Google. The official Facebook page for Google with the latest news and product announcements.